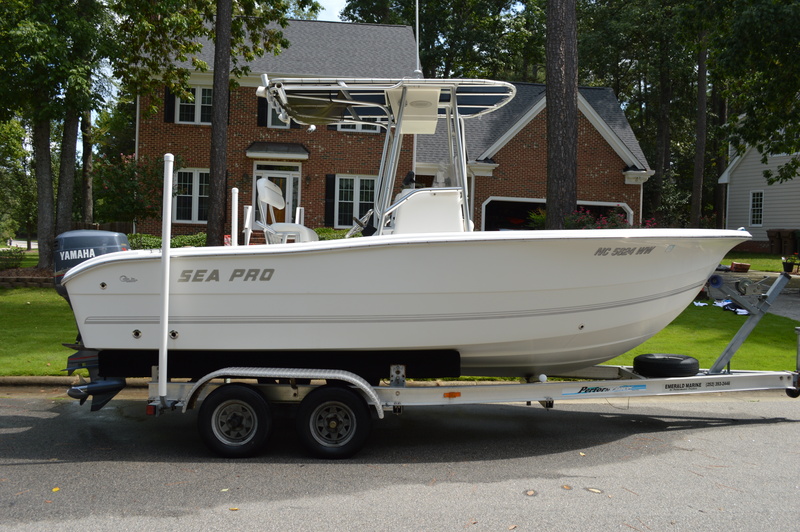 This 2004 Sea-Pro 206CC Deep-V Center Console boat is loaded and in really good condition! This very well maintained "clean" boat is powered by a Yamaha Saltwater Series 150HP OX-66 fuel injected engine, certainly one of the most dependable and economical engines! Complete with Custom T-Top W/ Electronics Box, PFD Storage, Full Window Curtain Set to stay dry, Rocket Launchers, two livewells in rear and wash-down capable. A Very Nice Aluminum Leaning Post W/ Removable Backrest, a pair of Rod Holders to each side for king fishing flat lines, Boarding Ladder, Trim Tabs, and Rear Center Seat. Cushions included for front seat and bow area. Good storage in center console, storage or fish cooler under front seat with built in cooler under middle seat. Included electronics are a Ray Marine DS-500-X Fish Finder, Furuno GP-32 GPS (preloaded with our personal fishing spots), Icom VHF Radio W/ Digital Antenna & Full Instrumentation. Includes a dual-axle 20FT Performance aluminum boat trailer with Surge Brakes and Bearing Buddies. Also includes a Yamaha Engine cover. Very low hours (Owner and son could not fish as much as they had hoped). Average 10-20 hours per year over last 5 years. This boat is ready to go fishing right now for the amazing Carolina coast fall fishing season! Well maintained with winterization annually. Priced right for quick sale! Clean and well maintained / equipped boats like this one are few and far between!